Give a champagne toast to any occasion with this 90 point blend of Pinot Noir and Chardonnay from Oregon's Willamette Valley boasts a zesty essence of lemon, honey, and pear. One bottle of Argyle Willamette Valley Brut Sparkling Wine. For more information on this wine, please see the Tasting Notes. This fine wine gift is presented in our enduring wooden wine crate. A complimentary card with your personal message or greeting is included with your gift. Personalize It! Your chosen name, date or personal message can be custom engraved on the surface of the wine crate lid. Simply complete the personalization information during checkout. Argyle Brut Sparkling Wine is a hand delivered gift. These gifts are delivered by one of our local design centers located throughout the United States and Canada. Same day delivery is available for most gifts when ordered before the cutoff time. The cutoff time for Argyle Brut Sparkling Wine is in the recipient's time zone. 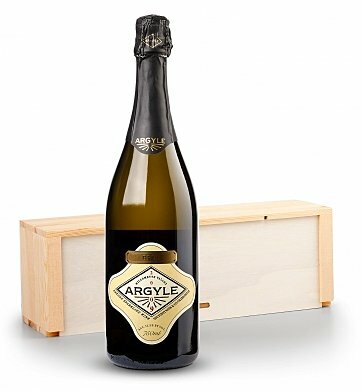 Argyle Brut Sparkling WineA bright, complex sparkling wine with juicy acidity and bountiful mineral notes. Oregon's Argyle Willamette Valley Brut Premier Sparking Wine. Presented in GiftTree's signature enduring wooden crate. I sent this as a congratulatory gift to a family that flips houses in TX (their first flip recently sold). Because the "requesting of signature" was a bit of a debacle, I had to reach out and inform them I was trying to deliver something that needed someone home to sign. Part of the surprise was ruined and it was delivered two days after closing, but they received it nonetheless. They loved it and thought it was fitting and thoughtful. I would use this company again, but perhaps not for a surprise delivery. My go to wine now!